Alexandria Ocasio-Cortez has already had a big week in the spotlight. During President Trump's speech, the 29-year-old Congresswoman stood her ground while others applauded, forcing her to respond to criticism for looking "sullen." Her eventful week continues today, when she will be holding a press conference to reveal the list of backers for her Green New Deal resolution. The freshman congresswoman has long championed a plan to combat climate change. Ocasio-Cortez spent her first day on Capitol Hill protesting climate change, so she's serious about saving the planet. NPR published the Green New Deal proposal along with an interview with Ocasio-Cortez about why now is the time to take this kind of action. The resolution names uncontrollable and destructive wildfires and "a risk of damage to $1,000,000,000,000 of public infrastructure and coastal real estate" as the many reasons why a new energy plan is necessary. "This is really about providing justice for communities and just transitions for communities," Ocasio-Cortez told NPR Thursday morning, leading up to the press conference. "So really the heart of the Green New Deal is about social justice." Who's already backing the GND? Ocasio-Cortez already has some heavy hitters on her side for this one. Presidential hopeful and senators Kirsten Gillibrand and Cory Booker. Elizabeth Warren and Kamala Harris are also reportedly on board, per The Washington Post. Climate change guru Al Gore is also in support of this plan. Climate change has never been an easy bipartisan issue. As Politico reported last month, the name alone is going to cause even some of the more progressive Republican lawmakers to balk. 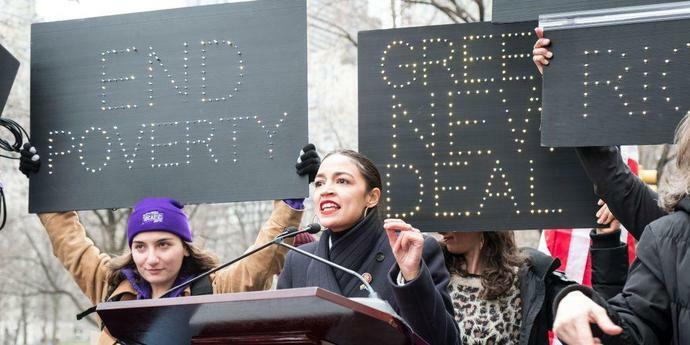 "The Green New Deal is not an ideal name if you want to attract bipartisan support," says Rich Powell, executive director of the conservative climate change group ClearPath, told the publication. The name itself sounds similar to the Roosevelt-era program The New Deal, which doesn't have the best connotation for more conservative lawmakers, even on the Democratic side, who oppose too much government aid. There will be more to come soon, most likely on A.O.C. 's trusty Instagram.